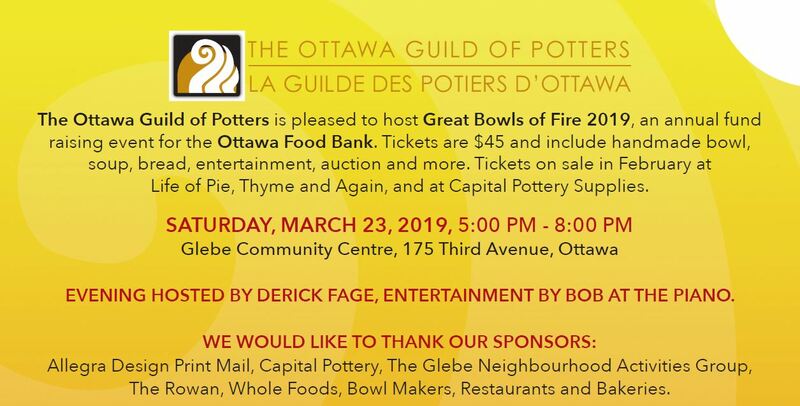 Great Bowls of Fire is a public event hosted annually by the incredibly talented and generous Ottawa Guild of Potters. The Guild, local chefs, bakers, and musical talent join together to support the Ottawa Food Bank. With your ticket you get to pick your own bowl to keep – created by The Guild – and then carry on to enjoy a delicious soup dinner in your new favourite piece of pottery. Join us for an evening of delicious soups, wonderful music, and beautiful pottery. For more information, please visit the Ottawa Guild of Potters website.